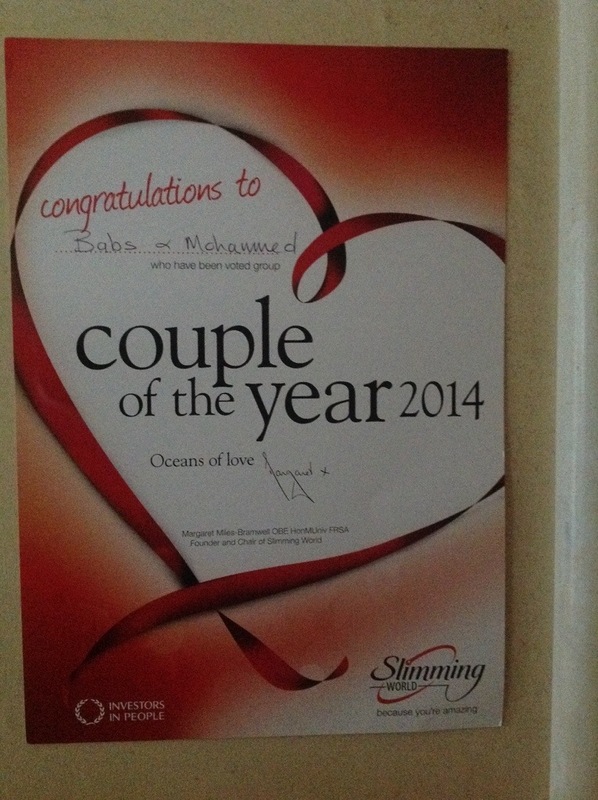 Today my husband and I were given the Couple of the Year award by our Slimming World group. We were delighted to share with our group as we always are about our slimming ups and downs and together we have lost over 5 stones and my husband remains in target as a target member. Our group consultant Denise is wonderful and never asks us to do anything she wouldn’t do herself. Her can-do attitude, as opposed to a can’t have attitude is always encouraging. We always enjoy the camaraderie at group and listening to ideas from other people. Staying to group makes you realise how we are all in the same boat and how one person struggling with something usually means others in the group are having the same issue. Whether it’s the family witch or unsupportive friends and/or work colleagues, being amongst those who want us to do well for a couple of hours every Saturday morning makes a huge difference to how we approach the coming week. Living with a target member has its plus and minus points but overall it’s much easier when we are on the same page and trying to eat healthily most of the time. We also enjoy eating out and eating desserts so don’t feel we are missing out on birthdays and special occasions. We always get tremendous support at our Slimming World group and from members on Facebook and those who read my blog. January was our one year anniversary of joining Slimming World and we look forward to another great year! Well done and congratulations! You totally deserve it! Aw thank you Jo! Hope you’re well! Jo you make my day, never been one accused of being cool but I’ll take that complement with a smile! 🙂 We have rain, sleet and strong winds here, I think I’d rather be where you are!